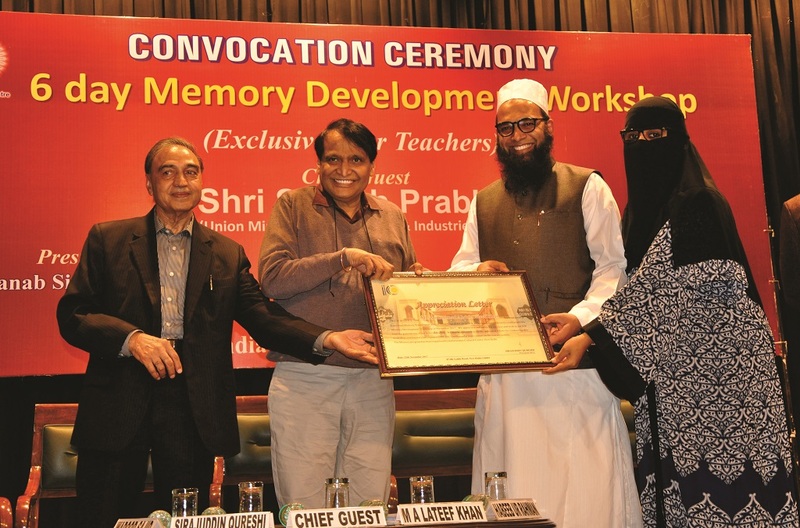 New Delhi: The IICC (Indian Islamic Cultural Centre) awarded “Memory Khan” title to Mohammed Abdul Lateef Khan, chairman of MS Education Academy, on 26th November 2017. Impressed with his mind mapping and memory techniques, the IICC awarded him the “Memory Khan” title at a gala progamme organized at the end of the week long memory workshop. 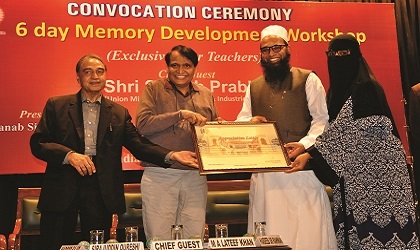 Central Minister of Commerce and Industries Mr. Suresh Prabhu, who was the Chief Guest of the Programme, gave away the title and certificate to Mohammed Abdul Lateef Khan. Central Minister Mr. Suresh Prabhu and his wife Uma, who accompanied him at the programme, were so impressed with the talent of Mr. Khan that they insisted him to come to his house for High-tea before leaving for Hyderabad. The chairman who is the certified trainer of Tony Buzan has been conducting mind mapping and memory training workshop at Delhi for the last 10 years. The IICC also awarded memento and certificates to the co-trainers Mrs. Nuzhat Khan and Mr. Habeebur Rahman. The memory work shop was held at Delhi in the 3rd week of November 2017. The newspapers of Delhi highly appreciated the Memory development workshop connected by our Chairman.